Transform Your Large Window Openings with Custom Palladian Shelf Blinds and Give it that Classic Look! If you want to make a style statement in your home, you must get Palladian shelf blinds! They are an architectural beauty that completely transform the windows in any space. There is nothing that comes close to the style statement of a Palladian shelf, and the best part is that it offers you complete privacy. You can choose to hang blinds on Palladian shelves, ensure that you protect your furniture from sun damage, and add class to your rooms. There is no other window treatment that comes close to the beauty of the Palladian shelf. That is the reason why it has a special place, and the best part is that it isn’t expensive either. At Creative Window Coverings, Inc. we offer affordable and high-quality Palladian shelf blinds that feature cutting-edge technology, and multiple colors, styles and designs. We can not only help you save money on window coverings, but add greater class in your home at affordable rates. How do Palladian shelves work? The best thing about the Palladian shelf is that it lets you hang shades or blinds on frameless and large arched windows, with no need to puncture the window frame. We have an extensive collection of Palladian shelf, which has been processed with American hardwood for superior strength and durability. We can customize different types of Palladian shelf blinds for any window size, in different colors and finishes to suit your requirements. How blinds for Palladian shelf windows work? You can add any type of blinds for Palladian shelf windows, with the most common option being the concealed brackets. You can also choose supporting brackets, or top-mounted brackets to install on your Palladian shelf windows. We can help create different types of Palladian shelf blinds for various window types, with an extensive range of finishes that complement your décor. Blinds or other window treatments may be installed either above or below the shelf. Get in touch with us today to learn more about our Palladian shelf window treatment. 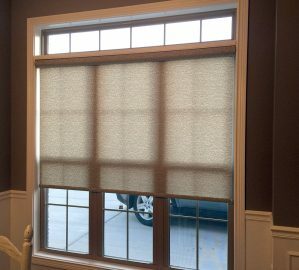 Since 1981, we have been providing complete custom window coverings like custom draperies, window blinds, window shades, roller shades, top treatments, plantation shutters and window covering installation. Window Covering-2019. All Rights Reserved.